Sheryl Burns’ list of accomplishments is lengthy, but in typical fashion she credited everyone but herself while accepting her award. A B.C. community social services worker and the president of CUPE 1936, Burns has been a trailblazer in educating people about the importance of accommodation within her workplace, her community and our movement. She has fought the discrimination against parents with disabilities that exists in the children’s aid system and has broken down barriers wherever she finds them. Burns, who grew up hard of hearing, credits her parents’ encouragement of her studies for her university degree when the school system suggested a more remedial path. 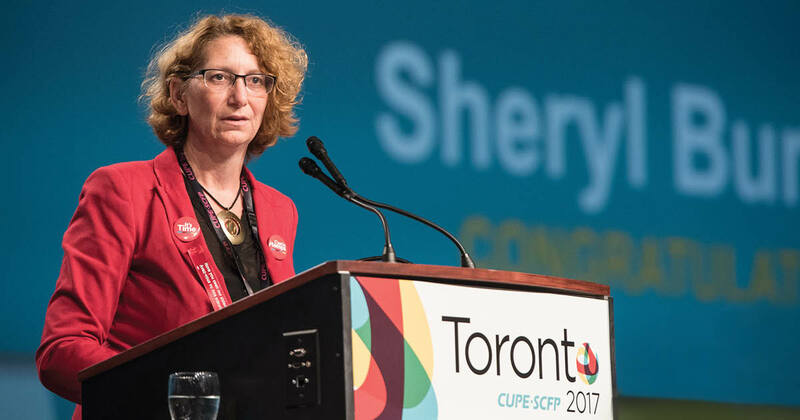 Along with many others, she credits her predecessor as CUPE 1936 president, Michael Lanier, for his mentorship and support for her activism within the union. Lanier sadly passed away earlier this year. “CUPE BC has been my landing strip where I was able to learn to fly,” she told the packed convention hall. Her journey has taken her to the international stage where she has presented at the United Nations in New York and to the Public Services International convention in Geneva.